Cubic Transportation Systems has recognized its Minneapolis/St. Paul customer, Metro Transit, for achieving near record high usage of its Go-To Card contactless smart cards in February 2013. The Go-To Card represented 54.7% of all fares collected during the month, with nearly 3.43 million rides paid for by using Metro Transit’s Go-To Cards, which include the Metropass and cards used by high school and college students. With the Go-To Card, riders tap their card to a reader, which automatically calculates and deducts the amount from their cards, speeding up the time it takes for riders to board. 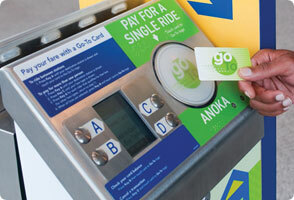 The Go-To Card is used across all modes of public transportation in the Minneapolis / St. Paul area including light rail and buses in addition to the new Bus Rapid Transit line coming this summer, which will have card readers at both the front and back entrances. “The rising use of the Go-To Card is good for Metro Transit and its customers, offering the convenience of cashless travel and one card to pay for all your public transportation whether bus, light rail or commuter train,” said Steve Shewmaker, president of Cubic Transportation Systems. Metro Transit is the 15th largest US transit agency based on its ridership, which exceeded 81 million in 2012. Metro Transit was one of the first transportation agencies in the U.S. to use contactless smart cards for fare collection, and Cubic was first awarded the contract to build their fare collection system in January 2002.